کیائی, مجید, بخشی, رضا, آهنگر, میثم. (1394). بررسی خواص فیزیکی و بیومتری چوب ال ‌اسبی (Evonymus latifolia ) در منطقه رویشگاهی چمستان نور. مجله صنایع چوب و کاغذ ایران, 6(2), 239-249. مجید کیائی; رضا بخشی; میثم آهنگر. "بررسی خواص فیزیکی و بیومتری چوب ال ‌اسبی (Evonymus latifolia ) در منطقه رویشگاهی چمستان نور". مجله صنایع چوب و کاغذ ایران, 6, 2, 1394, 239-249. کیائی, مجید, بخشی, رضا, آهنگر, میثم. (1394). 'بررسی خواص فیزیکی و بیومتری چوب ال ‌اسبی (Evonymus latifolia ) در منطقه رویشگاهی چمستان نور', مجله صنایع چوب و کاغذ ایران, 6(2), pp. 239-249. کیائی, مجید, بخشی, رضا, آهنگر, میثم. بررسی خواص فیزیکی و بیومتری چوب ال ‌اسبی (Evonymus latifolia ) در منطقه رویشگاهی چمستان نور. مجله صنایع چوب و کاغذ ایران, 1394; 6(2): 239-249. این تحقیق با هدف بررسی خواص فیزیکی و بیومتری چوب ال ‌اسبی در جهت‌های طولی و عرضی درخت صورت پذیرفت. برای این منظور تعداد سه اصله درخت سالم ال‌اسبی در منطقه رویشگاهی چمستان نور انتخاب و از هر درخت، سه دیسک به ضخامت 5 سانتیمتری از ارتفاع 1.30، 3 و 5 متری از ارتفاع درختان تهیه شد. سه نمونه چوبی در جهت عرضی درخت از مغز به سمت پوست به ازای هر دیسک بریده و سپس خواص فیزیکی (دانسیته بحرانی و همکشیدگی حجمی)، خواص بیومتری (طول الیاف، قطر الیاف و ضخامت دیواره سلولی) و ضرایب مورفولوژیکی با نرم‌افزار SPSS مورد تجزیه و تحلیل آماری قرار گرفت. نتایج آزمون تجزیه واریانس نشان داد که تاثیر مستقل جهت‌های طولی و عرضی بر همکشیدگی حجمی، طول الیاف، قطر الیاف و ضخامت یک دیواره سلولی معنی‌دار است. ارتباط معنی‌دار بین جهت عرضی با دانسیته بحرانی در چوب ال اسبی مشاهده شده است. میانگین دانسیته بحرانی، همکشیدگی حجمی، طول الیاف، قطر الیاف و ضخامت دیواره سلولی چوب ال‌ اسبی به ترتیب 0.558 گرم بر سانتیمتر مکعب، 18.21 درصد، 1.316 میلی‌متر، 25.02میکرومتر، 7.24 میکرومتر محاسبه شد. ضرایب مورفولوژی الیاف چوب ال اسبی شامل ضریب درهمرفتگی 53.19، ضریب انعطاف‌پذیری 42.06 درصد، ضریب رانکل 1.41، ضریب سفتی 28.96 درصد و شاخص Luce's shape 0.698 تعیین شد. روند تغییرات طولی خواص فیزیکی و ابعاد الیاف چوب ال‌اسبی از پایین به بالای درخت نزولی و با افزایش فاصله از مغز درخت صعودی است. Sabeti, H., 2008. Iranian trees and shrub. 5TH ed. azad Publication. Tabatabaei, M., 1961. Stdu on microscopic of Iranian wood. Tehran Pubication. Kiaei, M., 2011. Anatomical, Physical and Mechanical Properties of Eldar Pine (Pinus eldarica Medw) Grown in Kelardasht Region. Turkish Agriculture and Forestry, 35(1): 31-42. Moya, R., and Perez, D., 2008. Effects of physical and chemical soil properties on physical wood characteristics of Tectona grandis plantations in Costa Rica. Journal of tropical forest science, 20(4): 248-257. Panshin, A. J. and de Zeeuw C., 1980. Textbook of wood technology. Ed.4. McGrawHill Book Company, New York, p 705. Blouin, D., Beaulieu, J., Daoust, G. and Poliquin, J., 1994. Wood quality of Norway spruce grown in plantations in Quebec. Wood and Fiber Science, 26: 342–353. Zhang, S.Y., 1998. Effect of age on the variation, correlations and inheritance of selected wood characteristics in black spruce (Picea mariana). Wood Science and Technology, 32: 197-204. Zahner, R., 1968. Site quality and wood quality in upland hardwoods: theoretical considerarions of wood density. In: C.T. Youngberg & C.B. Davey, Tree growth and forest soils: 472-497. Zobel, B.J. and Talbert, J., 1984. Applied forest tree improvement. John Wiley, New York, p 511. Zobel, B. and Van Buijtenen, B., 1989. Wood Variation: Its Causes and Control. Springer Verlag, New York. p 363. Zobel, B. and Sprague, J., 1998. Juvenile wood in trees. Springer-Verlag, New York, p 300. Kord, B., Kialashkai, A. and Kord, B., 2010. The within-tree variation in wood density and shrinkage, and their relationship in Populus euramericana. Turkish Agriculture and Forestry, 34: 121-126. Kiaei, M., 2011. Basic density and fiber biometry properties of hornbeam wood in three different altitudes. Middle-East Journal of Scientific Research 8(3): 663-668. Kiaei, M., 2013. Effect of Cultivation Methods on Wood Static Bending Properties in Alnus Glutinosa. Drvna Industrija, 64 (4) 265-271. Franklin, F.L., 1946. A rapid method for softening wood for microtome sectioning. Trop. Woods Yale Univ. Sch For, 88:35-36. Wani, B.A. and Khan, A., 2013. Wood fiber variability in stems of Juglans regia L. from temperate. J Indian Acad Wood Sci, 10(2):95–102. Akgul, M. and Tozluoglu, A., 2009. Some chemical and morphological properties of juvenile wood from beech (Fagus orientalis L.) and Pine (Pinus nigra A.) Plantations. Trends in Applied Sciences Research, 4 (2): 116-125. Runkel, R., 1949. Uber die herstellung von zellstoff aus hollz der gattung Eucalyptus und versuche mit zwei unterschiedlichen Eucalyptusarten. Das Papier, 3: 476–490. Mahdavi, S., Hossinzade, A., Familian, H. and Habibi, M.R., 2006. The relationship between fibre dimension and wood density with diameter growth and age in the Eucalyptus camaldulensis Dehnh . 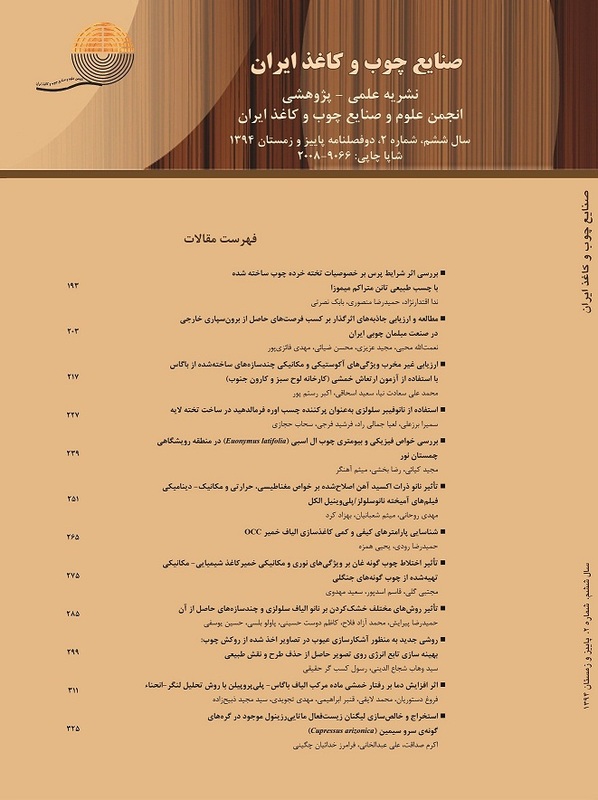 Iranian Journal of Wood and Paper Research, 19: 69-95. (In Persian). Kiaei, M., 2012. Effect of site and elevation on wood density and shrinkage and their relationships in Carpinus betulus. For. Stud. China, 14(3): 229–234. Monteoliva, S., Senisterra, G. and Marlats, R., 2005. Variation of wood density and fibre length in six willow clones (Salix spp. ), IAWA, 26:197–202. Gorgij, R., Tarmian, A., Nasiriani, S. and Oladi, R., 2014. Some anatomical, physical and chemical properties of toothbrush wood (Salvadora persica L.) grown in Zabol region. Iranian Journal of Wood and Paper science Research, 29 (1): 132-141. Adamopoulos, S. and Voulgaridis, E., 2002. Within tree variation in growth rate and cell dimensions in the wood of Black locust (Robinia pseudoacacia), IAWA, 23:191–199. Marsoem, S.N,. Haryanti, E. and Lukmandaru, G., 2002. Radial and axial variation in the fibre dimensions and cell proportion of Auri (Acacia auriculiformis) wood grown in the community forest. The fifth Pacific Regional Wood Anatomy Conference, Hosted by Gadjah Mada University, Yogyakarta, Indonesia Sep 9-14. Ridoutt, B.G. and Sands, R., 1993. Within-tree variation in cambial anatomy and xylem cell differentiation in Eucalyptus globulus. Trees, 8:18–22. Chauhan, L., Gupta, S., Madhwal, R.C., Pandey, R. and Pal, M., 2001. Interclonal, intraclonal and within tree variation in wood properties of different clones of Populus deltoids. Ind For, 127: 777–784. Ashori, A. and Nourbakhsh, A., 2009. Studies on Iranian cultivated paulownia – a potential source of fibrous raw material for paper industry. European Journal of Wood Prod, 67: 323-327. (In Persian). Enayati, A. A., Hamzeh, Y., Mirshokrai, S.A. and Molaii, M., 2009. Papermaking potential of canola stalks. Bioresource, 4 (1): 245-256. (In Persian). Ona, T., Sonoda, T., Ito, K., Shibata, M., Tamai, Y., Kojima, Y., Ohshima, J., Yokota, S. and Yoshizawa, N., 2001. Investigation of relationship between cell and pulp properties in Eucalyptus by examination of within-tree property variations. Wood Sci Tech., 35: 363–375.